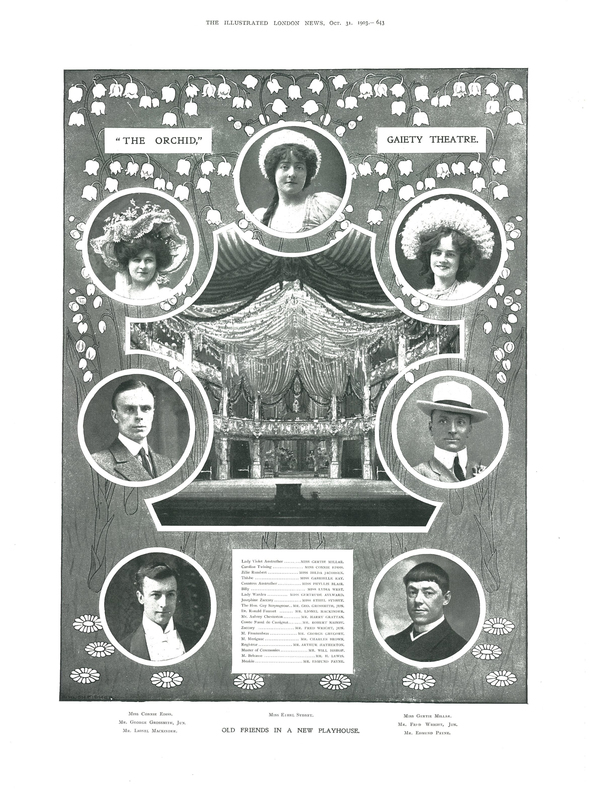 The successful opening of the new Gaiety Theatre, on Monday week, has been reported in our dramatic chronicle. This theatre, as our London readers know, has been built under the superintendence of Mr. C. J. Phipps, architect, on the site of the Strand Music-Hall and of some adjoining properties, which give it a frontage on the Strand, Exeter-street, Catherine-street, and Wellington-street. The Strand front of the music-hall remains almost as formerly. A few modifications, however, have necessarily been made on the ground story by the formation of the approach to the stalls and boxes of the theatre. The rooms over this entrance and the new building along the Strand and Catherine-street will form a restaurant, entirely distinct from the theatre, but with a corridor of access from every tier of the theatre. The entrance in the Strand leads by a few steps to the level of the stalls, and by a spacious staircase to the balcony or grand tier and the upper boxes. Another entrance, also on this level, is in Exeter-street, on the other side of the stalls, which, though designed specially as a private entrance for the Royal family, is available as an exit-way case of sudden panic, there being a stone staircase from the entrance to the highest floor of the theatre, with communication on every level. There is also a corridor running under the back of the pit, solely for the use of the stalls’ occupants, so as to get from side to side without crossing the audience. The entrances to pit and gallery are in Catherine-street, and the stage entrance is in Wellington-street. The auditorium includes a balcony, the front forming a semicircle of 24ft., opening out by arms of a contrary flexure a width of 43ft. to the proscenium column. Behind this is a tier of private boxes, as at the Adelphi, upper boxes, and a gallery above. The columns supporting the various tiers are carried up to a sufficient height above the gallery, and from the cap spring a series of pointed arches, supporting cornice and coved ceiling. The proscenium pillars are all of stone. The dimensions of the interior are – 54 ft. height from centre of pit to ceiling; 45 ft. depth from curtain to front of upper circle, and 36 ft. from curtain to front of balcony tier; 30 ft. width of proscenium; 41 ft. depth of stage, and 64 ft. width of stage between walls. There is room to seat 2000 persons. The floors of the boxes and corridors are of concrete upon iron joists. The stage has been constructed Mr. G. R. Tasker, clerk of the works. There is depth of some 20 ft. under it for sinking large scenes, and a height above of 50 ft. All the departments of the stage are very complete. There is a convenient green-room, and the dressing-rooms appear to be sufficiently numerous. The coloured decorations have been executed by Mr. George Gordon, who has also painted the act-drop, which a framed view of a palace on the Grand Canal, Venice. A noticeable feature of the decoration is the frieze over the proscenium, painted by Mr. H. S. Marks, 30 ft. long by ft. 6 in. deep. It represents a King and Queen of mediaeval times, with surrounding courtiers, watching mask which is being performed before them. On each side of this frieze, over the proscenium boxes, are lunettes in the arches – the one on the left represents lyric and the other epic poetry -designed by the same artist. 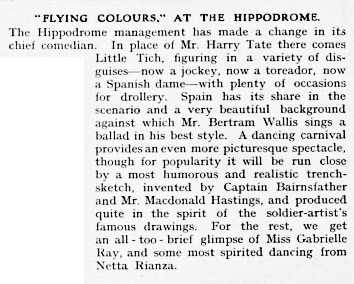 “Flying Colours,” at the Hippodrome. The Hippodrome management has made a change in its chief comedian. 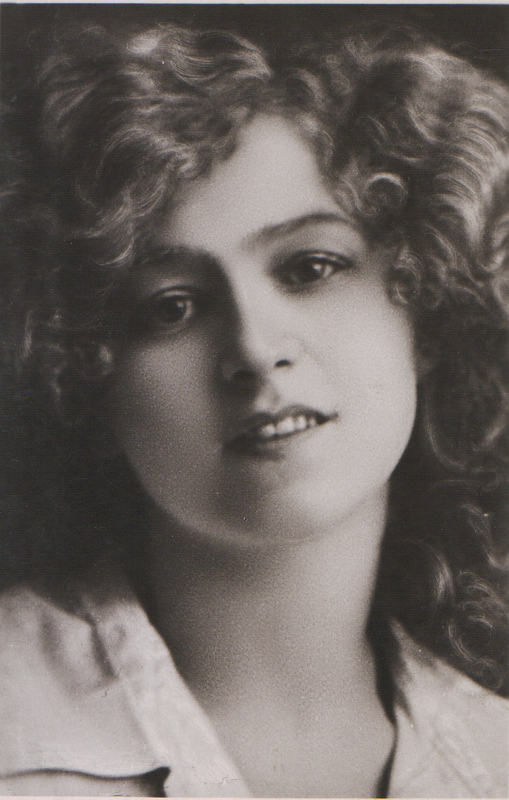 In place of Mr. Harry Tate there comes Little Tich, figuring in a variety of disguises – now a jockey, now a toreador, now a Spanish dame – with plenty of occasions for drollery. Spain has its share in the scenario and a very beautiful background against which Mr. Bertrum Wallis sings a ballad in his best style. 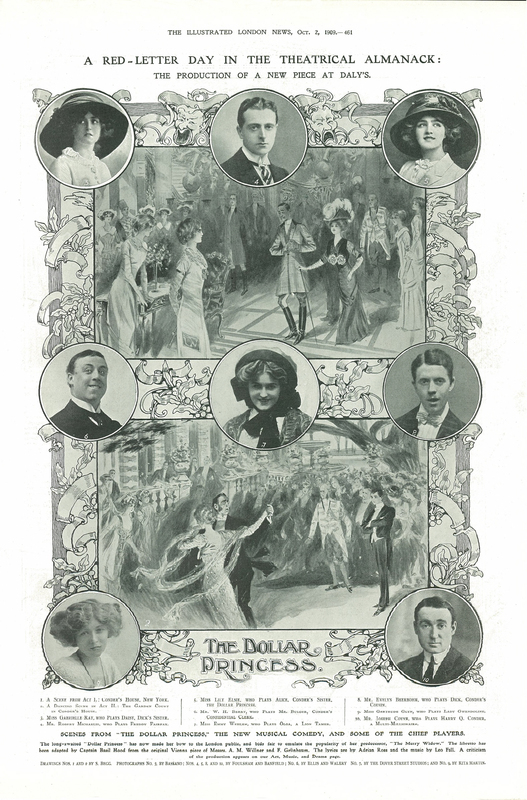 A dancing carnival provides an even more picturesque spectacle, though for popularity it will be run close by a most humorous and realistic trench-sketch, invented by Captain Bairnsfather and Mr. Macdonald Hastings, and produced quite in the sprit of the soldier-artist’s famous drawings. For the rest, we get an all – too – brief glimpse of Miss Gabrielle Ray, and some most spirited dancing from Netta Rianza. 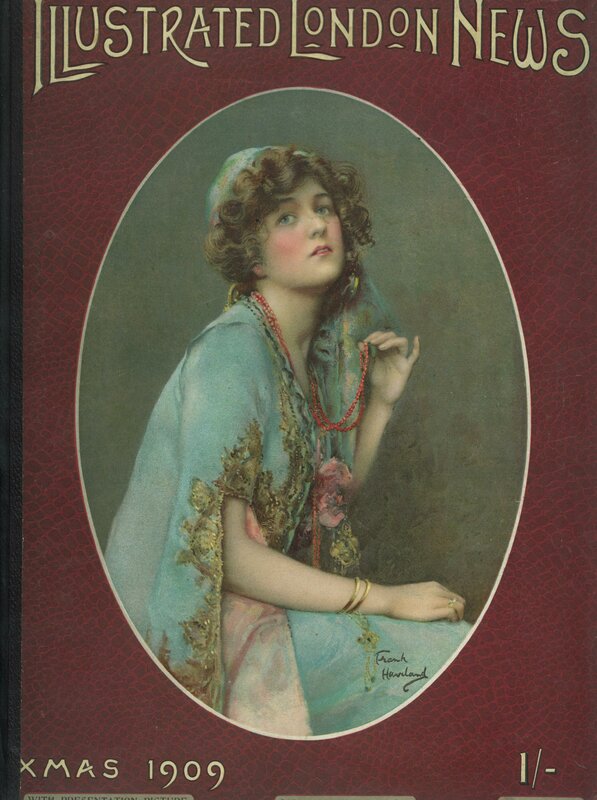 Illustrated London News – Christmas 1909 -This Frank Haviland cover shows a portrait of a girl in an oval frame in blue with a coral necklace against a background of burgundy and is of Miss Ray as she appeared as “Frou Frou” in “The Merry Widow” at Daly’s Theatre, Leicester Square, London.